Sauerkraut is one of the easiest of fermented dishes to make. Most of the store bought stuff is pasteurised so doesn’t have the health benefits that raw kraut has. It has the perfect sour taste to go in a burger or mixed into a salad. This recipe is simple and easy to make your own sauerkraut that will be loaded with beneficial bacteria that your gut will thank you for. This bacteria will also help digestion. 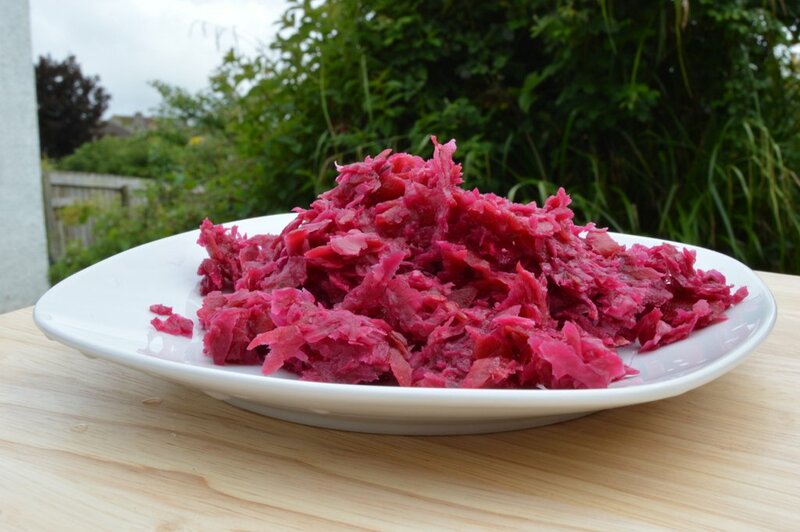 The only two ingredients needed for sauerkraut is salt and cabbage, however to give it more flavour some seeds and carrot are added. 1 tablespoon cumin seeds / caraway seeds / juniper berries – any of these work great for flavour. Grate the cabbage and carrot. Place the grated vegetables in a bowl and sprinkle on the salt and seeds. Leave to stand for half an hour. Massage the mixture until liquid is released. Pack tightly into a jar and place a weight on top, like a pint glass filled with water. It’s vital that there is a gap for gasses to be released, see the video below to show this. Ensure that the liquid level is above the veg, place on a saucer (as it will over spill) and leave for 1-2 weeks somewhere warm that’s out of direct sunlight. Check every couple of days to make sure the liquid level is above the veg, if not push down on the weight. When its bubbling you know its fermenting. Taste after a week, if it sour enough for you then you can eat it or store in the fridge for a few weeks. Else keep fermenting until it reaches the right sourness for you.